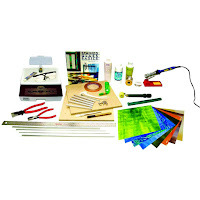 Many potential hobbyists who would like to start creating their own unique stained glass projects are overcome by the cost and sheer amount of stained glass and mosaic tile tools that are recommended to enter the hobby. When faced with the initial cost of purchasing the basic hand tools like pliers, glass cutters, glazing hammer, fid, lead came vise, soldering irons, ring saws, band saws, grinders, and finally a selection of stained glass; many people simply find the cost too exorbitant to enter the hobby. 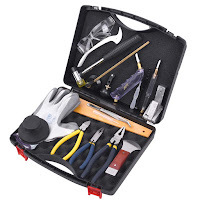 Fortunately, there several companies that offer quality "starter" or "start up" tool sets for beginners at economical prices that include all the hand tools needed for working with stained glass. The package above on the right includes everything necessary to start creating stained glass suncatchers almost "out of the box". As the proficiency of the hobbyist improves, most beginners will start to acquire more specialized tools that make constructing their projects easier. 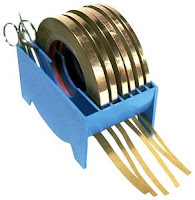 Foil dispensers or "automatic" foilers are usually one of the first items purchased to make foiling less tedious. Later on, the majority of hobbyists that decide to stick with the hobby will eventually purchase a circle or ring saw, band saw, or a high end grinder to make the job easier, especially if they plan to sell their creations online. The couple of examples below are best sellers that are versatile and have spare blades and parts readily available. 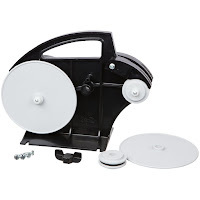 This is important when you break a belt or cutting blade and need a quick replacement to finish your project. In short, getting into the hobby of creating unique stained glass suncatchers, wall hangings, windows, table tops, etc. can be as economical or expensive as you can afford. These days it's as simple as clicking on a website online and waiting for your order to arrive on your doorstep. More on Mosaic Tiles to come.